Approx. 12 lbs per 100 pcs. Multi-location Imprint :	Add $45.00(G) set-up, plus $0.25 (G) running charge per location, per item, on new orders and reorders. Please Note :	There may be variations in the texture and color of this product because of the materials it is made of. 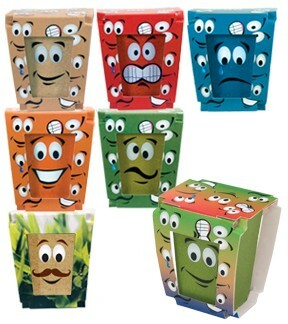 Packaging Design Options :	Expression Face Packaging in Red, Blue, Green, Orange, Tan, Multi-Colored, or choose Sprout design. Instructions are printed on the inside top panel of packaging. CUSTOM Package Design: Client submitted art on our template (see "Download Template"); no charge. AAkron custom design; $45.00 (G), includes a free e-proof. Pricing Includes :	Your choice of expression on one side & custom imprint on the opposite side of the planter. Includes Kentucky Blue Grass Seed or Choose from 8 Seed Packet Options... Flowers: Forget-Me-Nots, Pansies, Impatients, Poppies. Herbs: Basil, Chives, Parsley, Thyme. Soil Disk included. Setup Charge :	Add $45.00 (G) for new orders. No initial set-up charge on exact reorders. Shipping Weight :	Approx. 12 lbs per 100 pcs.